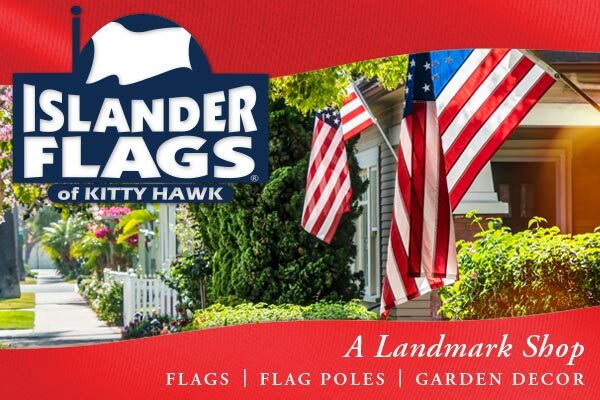 Islander Flags of Kitty Hawk, Inc. is a family-owned and -operated business which began on the Outer Banks of North Carolina in 1987. Now with over 30 years of experience in this industry, we have gained the confidence of our customers and are committed to customer satisfaction and creative solutions. This is a family business where we share the responsibility of management, creative design, sourcing and buying. Although you can order online on our website, please be aware that we offer much more including all types of in-ground flagpoles and flagpole accessories as well as custom flags for advertising use. Our product line includes all fabric products including display banners, tablecovers, lightpole banners and vinyl mesh banners. Our sister business, operated at the same location, is a full-service promotional products agency. Decorative home and garden flags, collegiate flags, windsocks, American flags, specialty flags and much more!